Here is a post from [John’s Projects]. For the insane, satirical, and incredible 2011 Omaha Groundhog Prom [John] and his buddy fabricated helmets reminiscent of our favorite robot rockers. 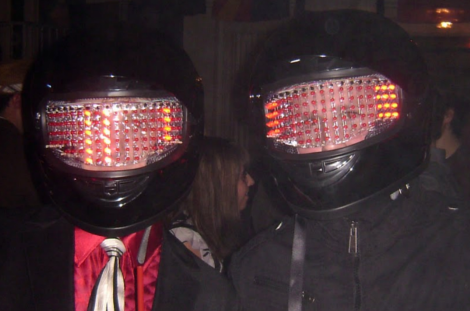 [John] needed something harder, better, faster, stronger than the competition and wound up creating LED matrices that mount behind aerodynamic motorcycle helmet visors. The helmets were constructed in about a weeks time and in a similar fashion to the real helmets. [John] sourced some cheap motorcycle headgear and mounted the LEDs, their driving transistors, and ballast resistors to a 1/32″ (flexible) plexiglass sheet that sits face to face with the wearer. [John] walks through the whole process starting with a half inch grid drawn onto a paper template. The template is cut from the plexi using tin snips, then LED holes are carefully drilled in the thin plastic using various bits up to 13/64″. The 90 some odd LEDs are, one more time, fitted then hot glued in place and soldered in vertical columns to simplify things and prevent any short circuit. An Arduino Pro (via common emitter 2n2222 on/off circuits) provides some digital love to the 18 LED columns and is connected to a Velleman Sound-to-light kit which modulates the brightness of the whole visor based on da funk. Two pots are also wired to provide sensitivity and pattern selection to the human after all. We can’t imagine the technologic setup is fresh after being subjected to the steam machine, high life, and whatever else for too long. Oh yeah, Some brighter LEDs could give the helmets night vision and make the whole thing come alive with emotion. Something about us is burnin to know what powers the helmets. Nice work [John]! If you are looking to do some homework on these high fidelity rock’n roll outfits in the prime time of your life check out this very detailed example, a helmet construction video, or finish the costume off with some EL wire. Check out some videos of these superheros rollin’ & scratchin’ after the jump! Way to show some Emotion, Jesse! I guess the people at Hack a Day are Human After All. haha, nice.I love how the helmets look but I wonder if they can see through the LEDs. It’s also pretty funny how daft punk songs are scattered throughout the article. Impressed with how many they crammed in! i wonder what some of those patterns do to your balance and motion ques after a while… when you take it off, do you immediately fall down and bounce your melon? Perhaps an overpowering urge to run backwards? I guess you’d have to be careful not to set it to the brainwasher setting. Anyone else tired of seeing these? It’s been done to death already. The original wasn’t even interesting. No, not even a little. Something about the Daft Punk style and feel really cannot be found anywhere else. It would be near impossible to mistake even a half-assed Daft Punk style helmet, its just so recognizable and unique. @KanchoBlindside: I couldn’t agree more. Daft Punk are a sellout electro-pop band now, so why are they so loved by hackers still? And the helmets… not original even by Daft Punk. They’re like the iPod: sure it was the most popular MP3 player, but it wasn’t the first. And the summary… I ground my teeth down just trying to get through it… and now I have a bunch of crappy “unce-unce” music in my head. Time to play some LCD Soundsystem to cleanse my pallet. Jeez! I love Daft Punk, but that was cringe! Ehh, cool, but what can it be used for? I love these helmets. Hope to see more. @haters. On no! people are spending thir own time and money for things they want to do. How dare they! am I tired of these? no. I wonder how hard it would be to make a helmet with a Sniper Joe look to it. Now i’m just waiting for a microphone and for them to move the lights in time with the music.